You can preview our currently available arrangements for Rock Brigade listed by instrument further down on this page. 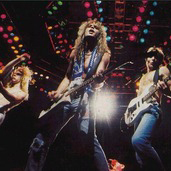 Rock Brigade was composed by Def Leppard. You may view the first page of any score before buying. This should allow you to make a more informed purchasing decision, and with tens of thousands of scores to choose from, there should be one appropriate for you. You can preview all available scores for Rock Brigade one at a time by clicking on this button . By clicking on the drop-down menu called "All Instruments" you can adjust to only view the arrangements for one specific instrument. Have you purchased any of the arrangements of Rock Brigade, and would you like to leave a review for one of them? Then please click on the box marked Comments below and you may leave your customer feedback on any of the scores by Def Leppard on this song page. You will need to select a nickname and be logged into your Great Scores account, but once that is done, you may leave your comment on the sheet music on this page. Are you can avid user of social media such as Linkedin, Twitter, Facebook or Digg? Then you can share this song page on your appropriate social media account, by simply clicking on the share button. You currently have the choice of 2 arrangements for Rock Brigade. Within that number of scores there is currently a choice of 5 instruments.